The Utah Science Technology and Research Initiative (USTAR), in partnership with the Air Force Research Laboratory, hosted an industry reception at the Capitol on July 10 in support of the Air Force Science and Technology 2030 Initiative. 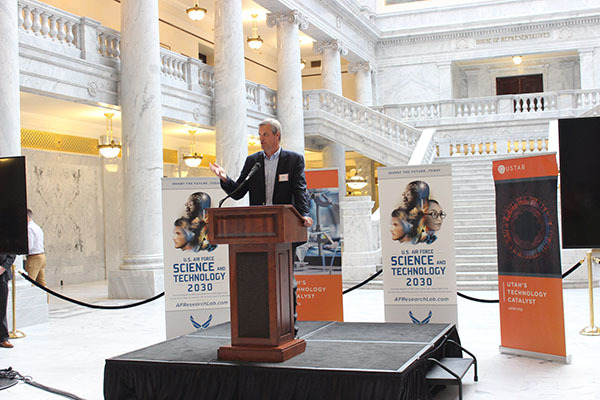 The reception was held prior to an Air Force Science and Technology 2030 Initiative workshop hosted by the University of Utah on July 11. The reception and visioning workshop were part of a series of six university events being hosted across the nation as part of the Air Force’s Science and Technology 2030 Initiative. The initiative was launched by the Secretary of the Air Force Heather Wilson to update the Air Force’s science and technology strategy, ensuring the Air Force remains at the leading edge of technological advances. “We’re looking for your engagement and your ideas to solve Air Force challenges,” said Air Force Research Laboratory Chief Technology Officer Michael Eismann, Ph.D., at the USTAR industry reception. As part of this effort in Utah, USTAR and the University of Utah assisted the Air Force Research Lab (AFRL) in reaching out to researchers, entrepreneurs, scientists and technologists to engage in conversations designed to find new scientific researchers and industry partners to help the Air Force invent the technologies that can play a role in the United States’ national security and defense in the future. Read more…..